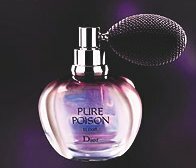 Christian Dior Pure Poison Elixir is an "Eau de Parfum Intense", and is said to be deeper & lusher than the original Pure Poison. It is available in a 30 ml bottle with bulb atomizer, or in matching body cream. I need to re-visit Mahora, because I love all of those notes, especially ylang-ylang, frangipani and tuberose. I wonder how it compares to AG Songes? Any thoughts on that, R? As to the Miss Sixty: Have you seen a picture of the bottle? It is purple and absolutely adorable! R, it has been awhile since I've smelled Mahora, but IIRC it is sweeter and more obviously & conventionally tropical than Songes (?) Will have to try it again. And yes, the Miss Sixty Elixir bottle is way cute…anything with purple is likely to attract me too! Me too! I love white flowers like frangipani and jasmine. I also like Ylang Ylang, which is the thing which makes Diorissimo such a winner for me, unlike other lily-of-the-valley fragrances, which just has all the sharpness without the warmth. L, I didn't have time to look extensively, but Mahora is definitely still available in the US, and for far cheaper than you would pay for it in the new packaging and name. I visited my mom recently and was going through her extensive perfume collection [she has bottles in her bedroom, her bath, my step-dad’s bath and the guest room]. I came across a bottle of Mahora [I think she has just about all of Guerlain’s fragrances]. I hadn’t tried this scent before, liked the look of the bottle and decided this would be one to spritz. I liked it so much I ended up wearing it almost every day I was there. Now that I see the notes listed here, no wonder it appealed to me so much. It’s been ages now since I tried Mahora — can hardly remember it!